It is through the generous donations of the members of our community that Camp Good Days and Special Times is able to continue our important work. There are many ways to donate and each is explained further below. 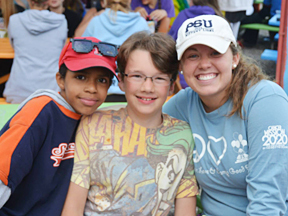 If you would like financial information about Camp Good Days, please visit our Financial Page. Camp Good Days is proud to have earned a Four Star Charity rating from Charity Navigtor! Click the icon below to read how we earned this prestigious rating. Click on the Donate Now button and help us bring in the smiles! We also invite you to review our Wish List for an additional way to help Camp Good Days. Visit our External Fundraising page and see how others in the community are helping Camp Good Days. Do you like to shop Amazon? Then shop AmazonSmile and support Camp Goood Days! The AmazonSmile Foundation will donate 0.5% of the purchase price of eligible products to Camp Good Days and Special Times. Simply go to smile.amazon.com and choose Camp Good Days & Special Times, Inc. as your charity to support. You can make it a one time donation or select to have every purchase you make on AmazonSmile go to Camp Good Days. Support Camp Good Days every month by enrolling in our Monthly Recurring Donation Program. All you have to do is download (PDF), print and complete the form, attach a voided check, and send both back to Camp Good Days and Special Times (address below). Our Monthly Recurring Donation program makes it easy for you to contribute and allows us to continue to enrich the lives of children, adults and families with cancer and other life challenges. Thank you for your continued support. Camp Good Days and Special Times, Inc.